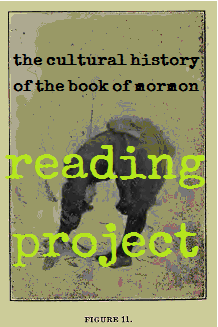 Volume One of the Cultural History of the Book of Mormon. Lots of thoughtful questions and replies so far, worth reading alongside the history. We can turn to the Book of Moroni, and read a promise. Not “Moroni’s Promise,” which is written to the Lamanites (and probably concerns the Sealed Portion, anyway, which his book probably prefaces). Instead, Mormon’s promise to Moroni, a father giving hope to his son. It is important that when we read “faith” and “charity” and so on, that we don’t use our words for what is a translation of his words. If we refuse to “define” and decode these words, and instead stay with the text, and insist that our understanding will be derived from the text (being composed in our language, however), we see that every abstraction (faith, etc.) is tied to more words, and we have a branching out of terms we cannot define in isolation. As the branches and the roots spread forth, however, they are rooted in something seen by Nephi in vision, and explained to him by the angel. There is a request we can make, and a gift that can be given. ye shall have hope? And what is it that ye shall hope for? Behold I say unto you that ye shall have hope through the atonement of Christ and the power of his resurrection, to be raised unto life eternal, and this because of your faith in him according to the promise. Wherefore, if a man have faith he must needs have hope; for without faith there cannot be any hope. And again, behold I say unto you that he cannot have faith and hope, save he shall be meek, and lowly of heart. If so, his faith and hope is vain, for none is acceptable before God, save the meek and lowly in heart; and if a man be meek and lowly in heart, and confesses by the power of the Holy Ghost that Jesus is the Christ, he must needs have charity; for if he have not charity he is nothing; wherefore he must needs have charity. And charity suffereth long, and is kind, and envieth not, and is not puffed up, seeketh not her own, is not easily provoked, thinketh no evil, and rejoiceth not in iniquity but rejoiceth in the truth, beareth all things, believeth all things, hopeth all things, endureth all things. charity, which is the greatest of all, for all things must fail–But charity is the pure love of Christ, and it endureth forever; and whoso is found possessed of it at the last day, it shall be well with him. We can all pray to be filled with that pure love of Christ, and be possessed and purified by it. This promise would also “prove” the Book of Mormon true, without being tied into a church, a missionary-delivery system, and a challenge to enter the waters of baptism, and be subject to a foolish and vain Cargo Cult-tradition. Posted in BOM Cultural History. Bookmark the permalink. Where are all the comments?! I finished reading the book, would have enjoyed an on-going dialogue, but know not where to find it. Thanks for posting these PDF files. I have finished reading your volume one, and I enjoyed it very much. My question is: What exactly do you mean by “we” in that sentence? But if by “we” you mean “some (wise) few,” then I question the economy of it. How many voices can be made to speak from the Book of Mormon? Perhaps there are many different worlds I/we/you/they would prefer that are equally acceptable to God also, and we should rethink the eschatologies our traditions have given us and the obscure standards they embody for the final judgment of things. If that is the case, then I must consider the Book of Mormon as only *one* such creative platform, and probably one that has mostly run its course, being as it is, tightly in the grasp of an authority-mongering church-corporation. Indeed, the Book of Mormon has become impotent to many, no doubt on account of the very things you describe in your cultural history. Some who no longer (or who never will) accept the tradition can, by extension, no longer accept a book that has been imposed upon by that tradition. Scripture-making (Authority-making) has effectively destroyed possibilities and limited the potential–the power–of the text. Once a big thing has been made of it, it’s hard to then start over on more reasonable grounds. I have to say: something big has been made of the Book of Mormon already. You’ve got quite a project on your hands if you want to reboot that. However, the world is full of *other* poetry waiting to be scripturalized. So my second question is: Do you believe that other books might serve the same purpose that you hope for the Book of Mormon? Yes, and I think Niggle’s little tale gives a version of what I intended by my phrase in the appendix. I don’t think a new orthodoxy should be built by “we,” as you know. Nor do I think “we” need a new book of scripture, say, doing unto this sci-fiction book what was done to the BoM. But the BoM can be used to create something else, and that is all that I really meant by that phrase about riding the whirlwind of the scripturalizing process. We don’t need or want more “scripture,” I agree with you. But the process can be used to create a different world, perhaps even free of orthodoxy and hierarchy, but that would depend on the story, and those readers breathing life into the story. Niggle’s painting come to life, as it were. Reading Project Vol.2A, and release of Vol.4!